Looking for Contract CAD Services and PCB Design Consultants? Do you want a second set of eyes on your CAD or PCB project? If you work on a small internal engineering team or your schedule is overloaded with projects nearing their deadlines, adequately reviewing your projects can be challenging. Instead of slowing down your production or sending your designs to fabrication and assembly before they’re at 100%, consider working with an electrical engineering consulting service. Consultants don’t just bring more manpower to the table—they bring an objective, industry-specific perspective. CAD and PCB consultants can review your team’s work and make sure all the details line up. In addition, consultants can provide specialty skill sets—such as insight into a particular project niche or experience with design tools that can drive efficiency. Every good project starts on the drawing board. Make sure your engineering projects get a solid start with computer-aided design (CAD). Computer-aided design helps you create new diagrams. With the right software, CAD creates detailed instructions and specifications that produce two- and three-dimensional diagrams and renderings. CAD software is a great tool for your engineering teams to test and modify different designs. Unfortunately, your team members might not have been trained in the newest CAD systems, or they may not have the bandwidth to input new projects into a CAD program. To address these shortfalls, consider hiring a consultant who can take your team’s ideas from pen-and-paper to detailed online diagrams that will be ready for production. Create detailed diagrams according to the specs and project requirements your team is facing. Teach your team how to use CAD systems or update their training to include the newest systems. Provide specialized knowledge on both specific engineering niches and/or CAD systems. Perform QA and support during your CAD adoption process to keep your projects on schedule. CAD consultants can help provide both short-term support and the long-term knowledge your team needs to shift to internal CAD design. Every aspect of electrical engineering and design is complex, and printed circuit boards (PCBs) are no exception. If your next project involves PCB layout design, consider hiring a design service provider. PCBs are a key component in electronic projects. Instead of old-fashioned point-to-point wiring, PCBs are smaller, cheaper, and more durable circuit boards that have optimized nearly all modern consumer and industrial electronics. Each layer requires precise design and meticulous fabrication to ensure that the end product features high-quality functionality and is durable during transport and use. Efficiency – Consulting services can scale work up or down as you need it and produce layout coverage shifts faster. Expanding your team with temporary consultants helps you increase production without losing quality. Increase profits with variable costs -Outsourcing detailed and infrequent work is a great way to balance business expenses. Instead of maintaining a full-time staff to manage infrequent or specialty projects, hire that expertise only when your company requires it. Cutting-edge knowledge – PCB technologies change constantly. Consultancy firms stay on top of the newest technologies, processes, and layout techniques to guarantee the highest quality end product. 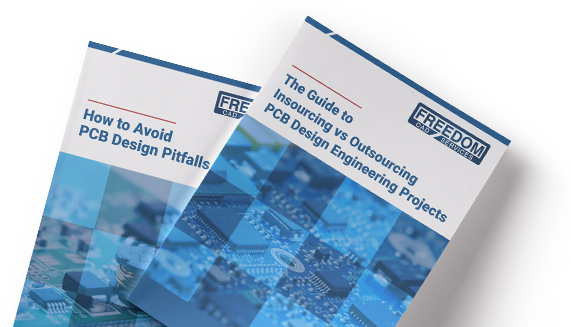 Hiring PCB consultants isn’t just a good engineering decision. It’s a good business decision. What Can Freedom CAD Do for You? Freedom CAD provides consulting services for every aspect of electrical engineering, PCB layout, and manufacturing. Whether you want a fresh pair of eyes to review a highly complex project or you need help training your team on the newest CAD system, we’re here to help. For more information about Freedom CAD’s consulting services and how we can help your team meet your project goals, please contact us or request a quote.